Amtrak says track improvements in Maine and New Hampshire will bring changes and interruptions to its Downeaster passenger rail train that goes from Freeport, Maine, to Boston. Downeaster passenger trains carried more than 511,000 passengers in the year ending June 30. That makes for the highest 12-month ridership figures since 2014. 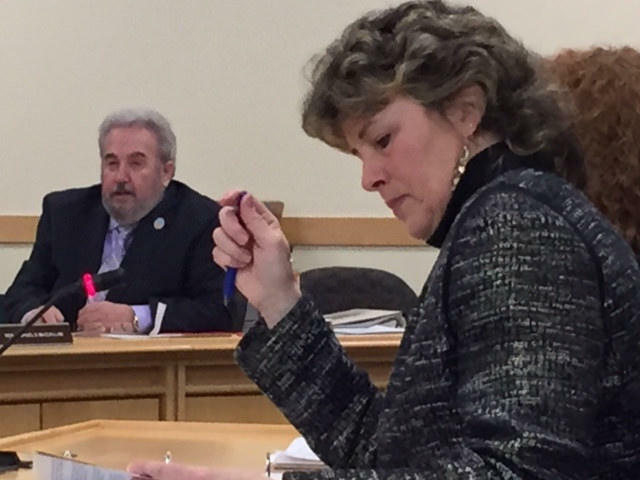 Maine Passenger Rail Authority chief Patricia Quinn says ridership on the Amtrak service was up nearly 9 percent from the year before, despite track work last fall that caused some trains to be canceled. "We still - even though we had a lot of service interruptions - still saw ridership exceed our best ever in six of the 12 months of last year," Quinn says. "So we're really excited about that." PORTLAND, Maine - A man who police say drove his car around a line of waiting cars at a train crossing and collided with a moving Amtrak Downeaster train this morning in Portland is in the hospital being treated for non-life-threatening injuries. Derso Mekonen had two children who weren't his own in the back of his car when he hit the train. The collision crushed the front of the car, but left the five- and nine-year-olds uninjured. They've since been returned to their mother. PORTLAND, Maine - Amtrak's Downeaster has been a runaway success, transporting more than 6 million passengers. But success was no guarantee when the first train departed on the cold, rainy morning. Even rail advocate Wayne Davis, who successfully lobbied for the service, said the Portland-to-Boston passenger route wasn't a sure thing, even after multiple studies and more than $50 million in taxpayer spending on track upgrades. That was 15 years ago Thursday. BRUNSWICK, Maine - The Northern New England Passenger Rail Authority will unveil a new layover facility in Brunswick this weekend that will service Amtrak Downeaster trains overnight. The authority is planning to hold a public open house at the layover shed on Saturday. A spokeswoman says this may be the public's last opportunity to see the building's interior. BRUNSWICK, Maine (AP) _ Construction has begun on a 650-foot by 70-foot layover facility in Brunswick that will service Amtrak Downeaster trains overnight. WCSH-TV reports that the Northern New England Passenger Rail Authority received its final permit from the state Department of Environmental Protection and began construction earlier this month. BRUNSWICK, Maine — Maine environmental regulators have approved the last remaining permit needed for construction to start on a nearly $13 million layover facility for Amtrak trains in Brunswick. The Portland Press Herald reports that Maine Department of Environmental Protection awarded the permit Tuesday. PORTLAND, Maine — Amtrak's Downeaster service between Boston and Maine is expected to carry 57,000 fewer riders and take in $1 million less in revenue this fiscal year compared to the previous one. The Northern New England Passenger Rail Authority, which runs the service, blames the declines on harsh winter weather and problems with a track rehabilitation project that has forced the cancellation of hundreds of runs. PORTLAND, Maine — The Northern New England Passenger Rail Authority says no one was hurt when Amtrak's Downeaster derailed a couple of miles from the Portland station. Executive Director Patricia Quinn says 41 people were on board when the locomotive derailed shortly after the Boston-bound train left the Portland station. The passenger cars were hauled back to the Portland Transportation Center, and track owner PanAm Railways replaced a section of rail. The incident led to the cancellation of several trains on Tuesday. Officials say normal service will resume Wednesday. YARMOUTH, Maine - Police say a Maine woman was hospitalized when her car collided with a train in Yarmouth. The Portland Press Herald reports an Amtrak Downeaster train hit a car driven by 24-year-old Kathleen Estabrook of North Yarmouth on Monday. The train was headed for Freeport. Police say Estabrook's injuries are not life threatening. Police say the cause of the crash is under investigation. PROVIDENCE, R.I. - Amtrak says it is operating on a modified schedule in New England because of the recent snowfall in the region. Amtrak said Tuesday that passengers with reservations on Northeast Regional or Acela Express trains should check the status of the trains before leaving for stations. 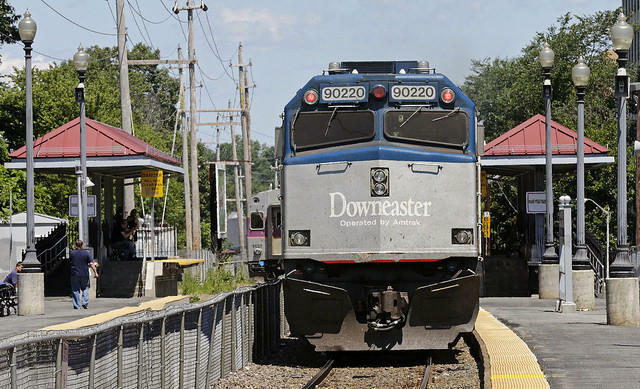 The Downeaster service between Brunwsick, Maine, and Boston was canceled Tuesday and Amtrak's shuttle service between Springfield, Massachusetts, and New Haven, Connecticut, was also on a reduced schedule. PORTLAND, Maine - Amtrak Downeaster train service from Brunswick, Maine, to Boston is canceled due to snow removal. Amtrak says the rail service is suspended all day on Tuesday because railroad tracks are shut down for snow removal. The train normally runs daily round trip service from Portland to Boston, with two extended trips to Freeport and Brunswick. BRUNSWICK, Maine — Supporters of a plan to build a $12.7 million layover facility for Amtrak locomotives in Brunswick are using a drone to make their case. Aerial video distributed by TrainRiders Northeast shows the tracks, the proposed layover site and the neighborhood that's been fighting it. No houses can be seen because the neighborhood is hidden behind a buffer of trees. Critics of the proposal say the video is misleading. DURHAM, N.H. - An Amtrak Downeaster train struck and killed a woman in Durham, New Hampshire, Wednesday night. Local police say it was a suicide. There have been three similar incidents in Maine this year involving the Downeaster.